Its scientific name Gypaetus barbatus refers to its body aspect (from the Greek “Gyps”: vulture and “aetos”: eagle and the Latin “barbatus”, referring to the beard that protrudes below its beak). Its eyes are surrounded by a red sclerotic ring, which becomes more visible when the individual is aggressive or nervous. A black mask extends from the eyes to the base of the beak, where fine feathers (forming the beard) appear. On the top of the head there are black feathers that form a hood. The tail has a wedge or rhombus shape and the tarsi are covered with feathers. The bird goes through different stages of plumage depending on its age (young, subadult and adult). Both sexes are the same colour, in the case of orange adults the colouration is due to the habit of dyeing their plumage with mud. The head and neck are black. Very small beard. Iris brown. Obvious white dorsal shield in the shape of a V. Chest, belly and leg feathers (trousers) mottled grey-brown. Rounded flight silhouette, no moult. The head and neck are black. Visible beard. Iris yellow. Dorsal shield fading. Irregular flight silhouette (longer and pointed feathers, new rounded and shorter feathers). Pale head and long beard. Iris yellow-white. Flight silhouette similar to the adult, with long, narrow wings and a long tail. Head and neck orange. Back black. Thin black collar with chest, belly, and trousers of uniform appearance, normally orange (depending on the mud baths). Stylized flight silhouette. The Lammergeier is a scavenger bird, which specialises in feeding on bones. Its wide gape and the possession of a large number of acid-secreting cells facilitate the digestion of bones. 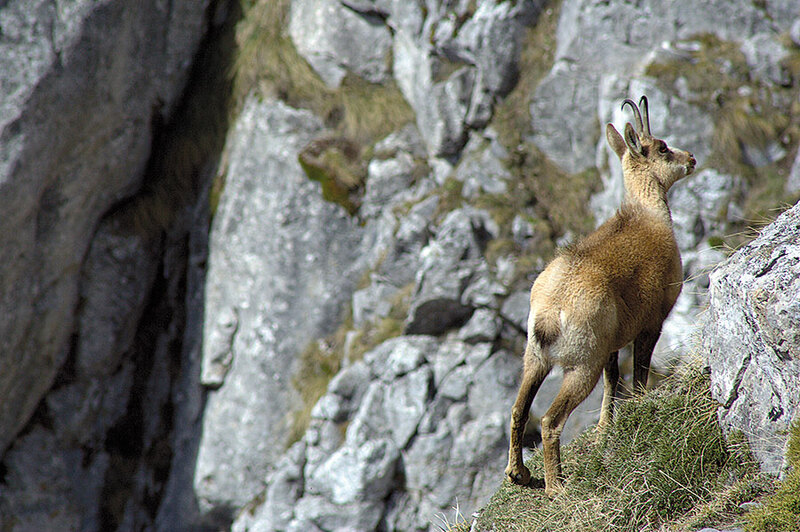 Wild ungulates (Rupicapra) and domestic livestock (Ovis and Capra) are the main sources of food for the Lammergeier in the Pyrenees. During chick rearing, the remains of domestic and wild ungulates can account for up to 67% of the food supplied to the nest. The bird´s common name in Spanish,”Quebrantahuesos”, comes from the particular technique it uses to ingest food. This consists of breaking large bones, which cannot be swallowed whole, into pieces of adequate size. The species acheives this by throwing the bones from the air onto rocky areas that are called “breakers” (rompederos). 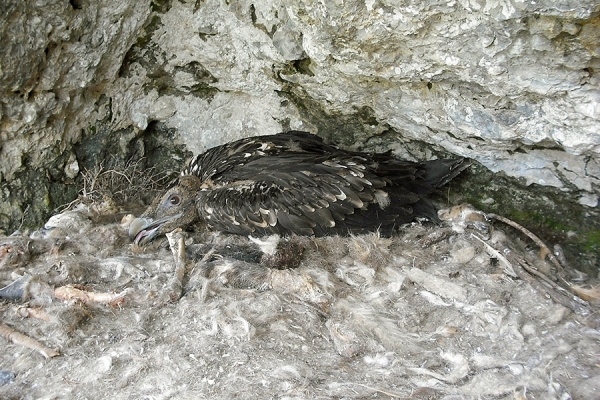 The Lammergeier has a long reproductive cycle, divided into several stages: pre-laying (September-November), incubation (December-February), breeding (March-August) and emancipation of chicks (January). During the pre-laying stage the species carries out activities related to the construction of the nest (preferably in caves), and territorial defence, and this is also the period of sexual activity. 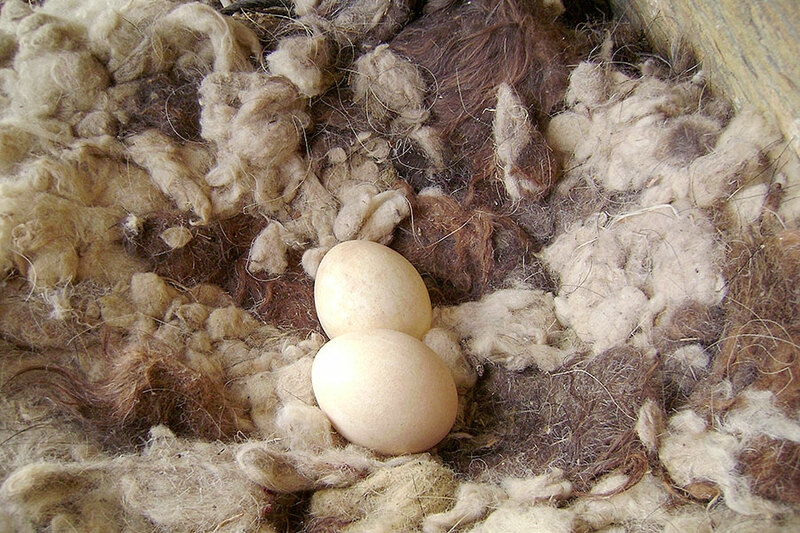 The nests are composed mainly of branches and wool, the latter being fundamental for maintaining the temperature of the nest during incubation. One or two eggs are laid, with an average laying interval of about six days between the first and second eggs. Incubation occurs in the middle of winter, hence the end of the reproduction period coincides with the period that provides the greatest reproductive success. The species forms pairs at an average age of seven years and they make the first attempt to lay at between 8-10 years of age. Both males and females take part in incubation, on a permanent basis, the percentage of interruption being not higher than 5%. This is because of the high risk of embryo death, due to the low temperatures and the possibilities of predation. The average incubation period after laying is 53 days. If two chicks are born the first chick has been observed to be aggressive towards the second one, which results in starvation of the younger chick, hence contributing to a reduction in the number of progeny. The average age at which the chick leaves the nest is 120 days. The reproductive units (RU) can be composed of two or three adults, in the latter case there are usually two males and one female (polyandrous trios), although exceptionally RU have been formed by four individuals and also by two females and a male (polygynous triplets). 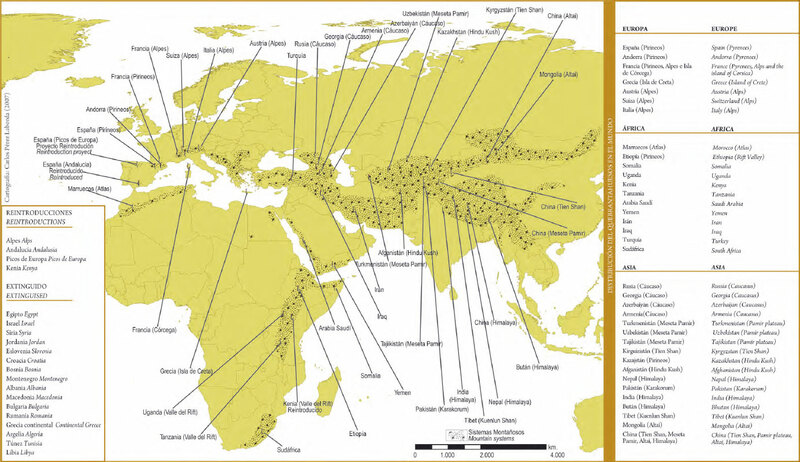 Each of these RU exploits a surface of between 100 and 300 km². The nesting areas are defended from other individuals in a territorial fashion, with the distance between occupied nests ranging from a minimum of 3 km to a maximum of 28 km. 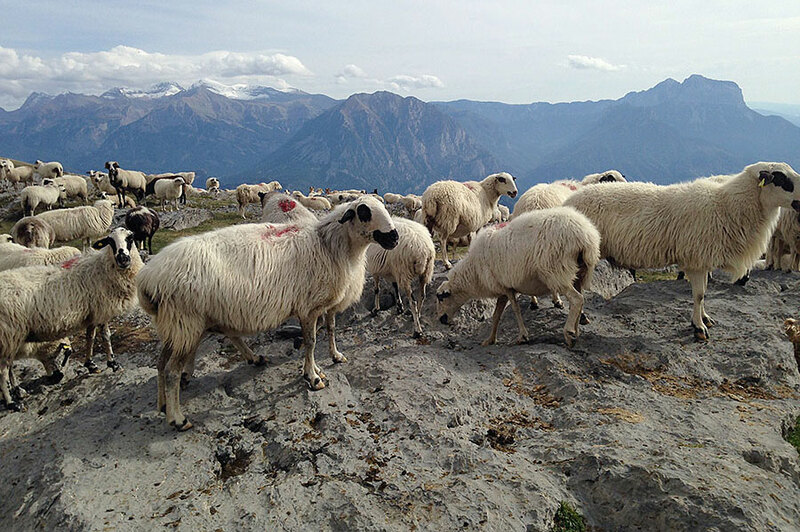 The pre-adults perform dispersive movements both within the Pyrenees and towards other mountain ranges: Picos de Europa, Sistema Ibérico etc. 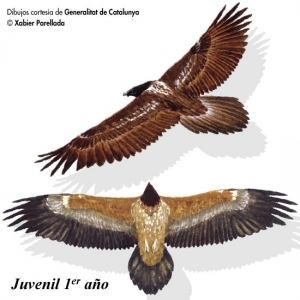 Possibly one of the most critical stages in the bird´s life cycle is juvenile dispersion. This period can be defined as the movement that an individual makes from its place of birth to the place where it reproduces or could reproduce, if it has survived and has found another individual. In most raptors, juveniles are more likely to make longer journeys, since a significant proportion of adults are territorial. 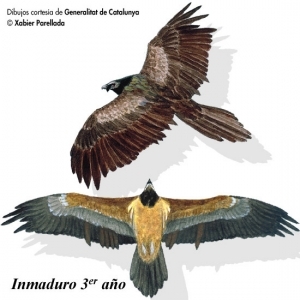 The pre-adult birds tend to concentrate on the southern slopes of the Pyrenees (January-April), with dense cores in the vicinity of the Supplementary Feeding Points (PAS). 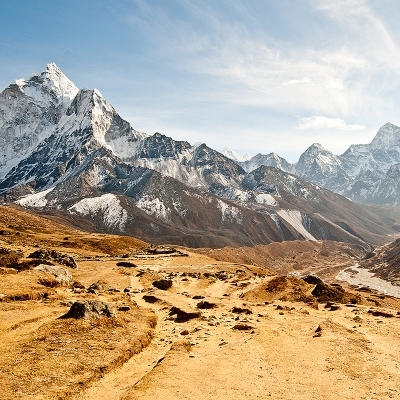 Individuals of between four and five years of age make the largest displacements along the mountain range, but on reaching seven years of age there is a decrease in the radii of dispersion, particularly between October and December. This is possibly due to territorial behaviour. 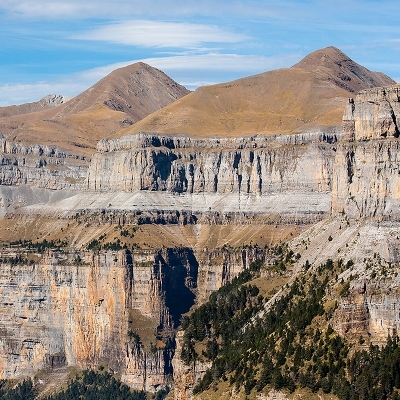 In this age group, the appearance of centers of activity at the western and eastern ends of the mountan range is very significant, since it could favour the settlement of important population centres in these segments of the Pyrenees; in addition, and in the specific case of the western nucleus (Navarra and the Basque Country), this of great strategic interest, in the face of the management of the species, since it can be considered as an authentic geographical bridge between the Pyrenees and other mountain territories of the Iberian Peninsula (Cantabrian Mountains). 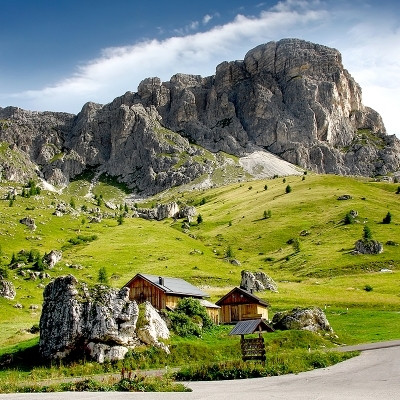 It is a species that is present in mountainous zones, preferably those where there are open spaces and areas with steep walls. Their presence coincides with the existence of populations of wild ungulates and domestic livestock, which are their main source of food. It is a territorial vulture that is present in some mountainous regions of Europe, Asia and Africa, occupying between 1 and 10 million Km2 and with an estimated population of between 10,000 and 100,000 individuals. There are two subspecies: G. b. barbatus, which is the most widespread and is found in the main mountain ranges of Eurasia and North Africa (Atlas, Pyrenees, islands of Corsica and Crete, Asia Minor, Middle East, Caucasus, Iran, Hindu Kush, Tian Shan, Altai, Pamir Plateau, Karakorum, Kuen Lun and Himalaya) and G. b. meridionalis, that is distributed amongst some mountains of the South and the East of Africa, mainly in Ethiopia (Abyssinian mountains) and South Africa (Drackensberg mountains), as well as in some isolated mountainous enclaves in Kenya and Tanzania. 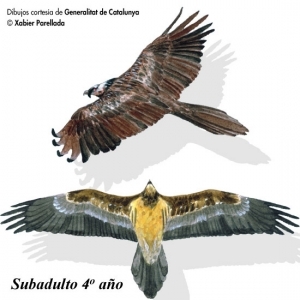 El principal carácter diferenciador de ambas subespecies es la ausencia de plumas negras en la región auricular de G. b. meridionalis. Actualmente tan solo se conocen adecuadamente las poblaciones de la UE: Pirineos, Alpes, Córcega y Creta y Sudáfrica. Factors that negatively affect the conservation of the species are unnatural mortality (poisoning and electrical lines), loss of habitat, reduction of food resources and failure of reproduction due to human disturbance (beatings during hunts, sports activities etc.). The information on the distribution and status of the bearded vulture in the world is basic for its conservation, being scarce and dispersed. 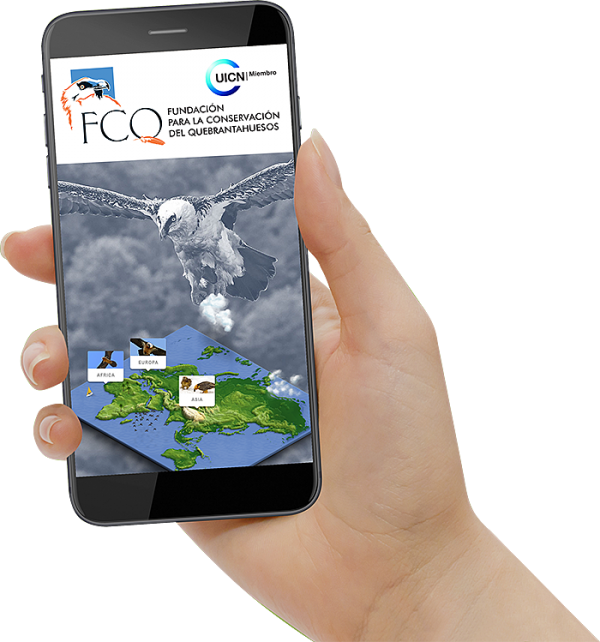 In order to update it and share it with all the people interested in the bearded vulture, then collaborate with your travel observations on their populations and distribution area. 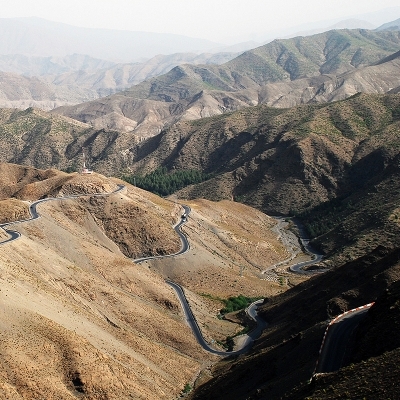 In this section should not go part of sighting, should be in pursuit of bearded vulture. The study of many of the issues that are considered priorities for the conservation of the species (survival, vital areas, juvenile dispersion, obtaining samples for genetic and toxicological analysis etc.) involves the capture, marking and monitoring of the birds. 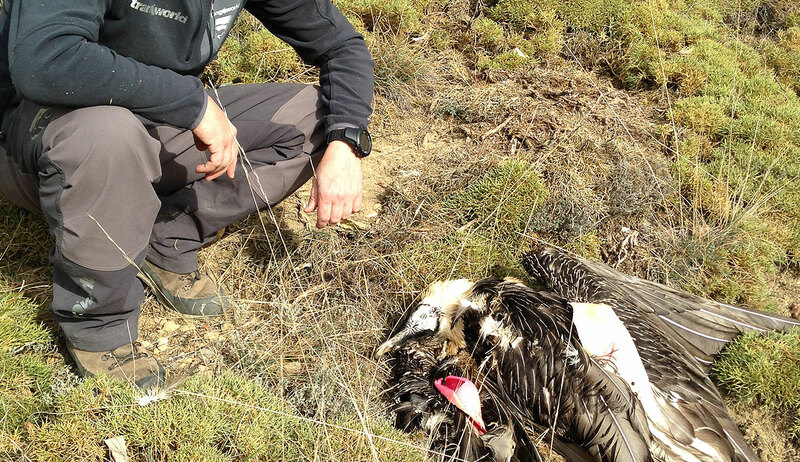 Since 1994, thanks to the monitoring programme of the species, Lammergeiers have been captured and marked in the Pyrenees by a variety of methods: in the nest, with nets, and in wildlife recovery centres. Short-lasting (discoloration in feathers) and long-lasting marks (metal rings, PVC, wing bands and VHF radio-emitters and satellites) have been used. The total weight of the material placed was calculated, in order not to exceed 5% of the weight of the bird. 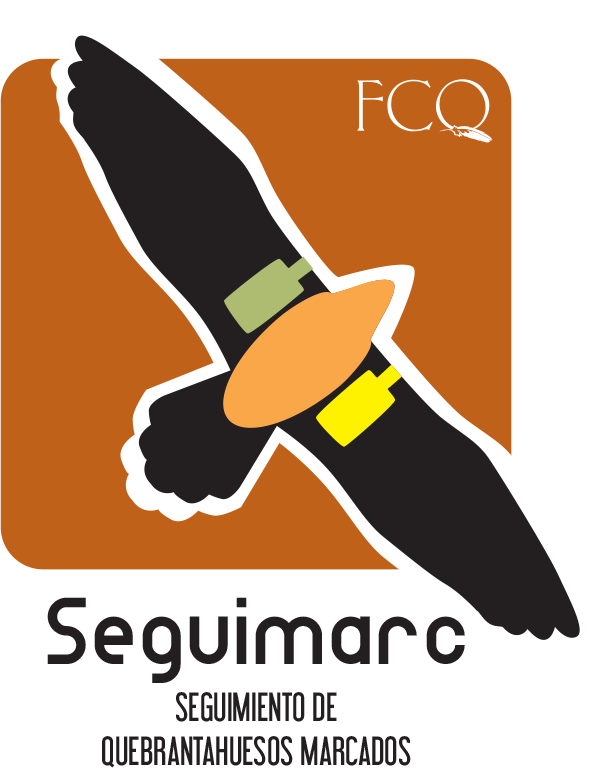 Carried out through visual observations by FCQ technicians and volunteer observers, and by telemetric radio-tracking at dominant points and near the feeding sites of necrophagous birds. 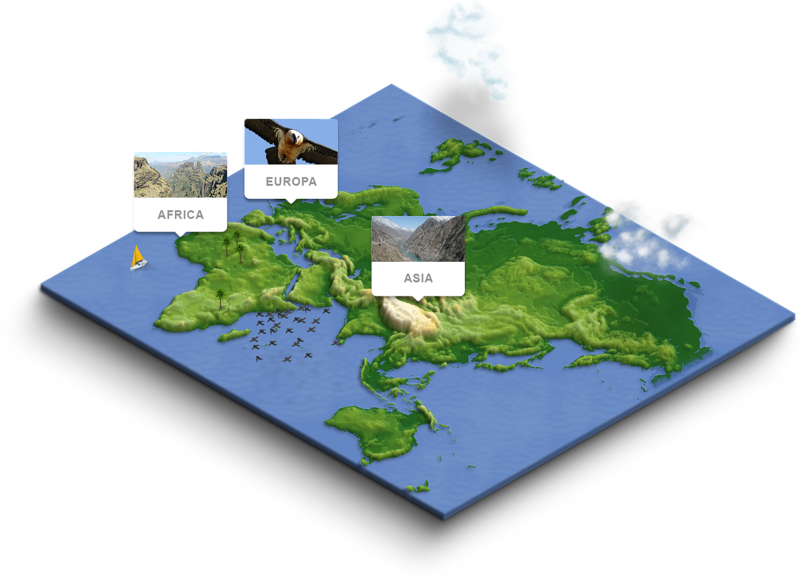 Carried out by attaching satellite GPS (Global Position System) transmitters to the birds, which gives information about the exact position of the individuals, their hunting areas and their movements. We have been able to estimate the size of the preadult population and its survival. Wounded specimens have been located, which have subsequently been recovered and released. The causes of mortality have been ascertained: power lines, poisoning, disease etc. and subsequently management plans have been adopted to reduce these deaths. Juvenile and natal dispersion patterns have been described. We have been able to take legal action in cases of unnatural mortality. The marking programme has provided information for the development of scientific publications on the species, with solutions for its proper management. You can now download our tracking app, with it you can easily identify the lammergeier marked. 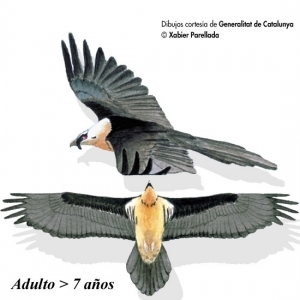 We will keep you informed of all the news about the Bearded Vulture.